Fully expecting a headache, I still had to investigate the precision and grandeur of this concocted Japanese spectacle! I also needed to do some head banging to eradicate the garbage that passes as music today from my mind. 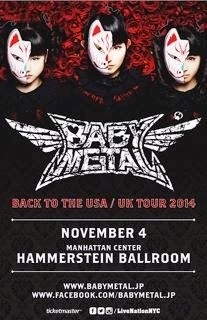 When the band formed in 2010, two of the Babymetal girls were age 10 and one age 12. None of them knew what Metal music was. Now that they know, their influences are X-Japan and Metallica. Their first YouTube video went viral. Upon release of their first album, they played to a crowd of 20,000 at Budokan. They have since opened for Lady Gaga, and appeared at Sonisphere 2014 with Iron Maiden and Metallica. The girls’ mostly red and black outfits combine samurai warrior battle gear with gangsta hoodies and fairy princess frills. Their matching surnames (like the Ramones) are ‘Metal’; Yuimetal, Moametal, Su-metal. In fact, the fun factor and high energy of this show and the entire audience was reminiscent of a Ramones gig. The magnificent talent of their Scary Kabuki attired band, Kami propels the incredibly polished presentation. It is sheer perfection. Otherwise, any of the girls or the band members would swiftly be replaced by one of thousands of Japanese idol clones at the manager’s disposal! This was their first New York appearance. An introductory film discloses Babymetal’s folklore – The Legend Of The Fox God; a tale of three chosen girls decreed by the Fox God to create a new form of Metal. The girls were electric, as they burst onstage from behind the video screen amidst exploding fireworks. Behind fox masks, they make the paw gestures of a fox (instead of devil horns). Metal merged with reggae, Hip-Hop and Pop – all with positive lyrics, although in Japanese. There was something for everyone, except for Easy Listening! Sure it is a gimmick, but there is integrity in the amazing presentation, professionalism and showmanship. Su-metal’s vocals were strong yet childish, especially on the ballad ‘Rondo of Nightmare’. Remember when the rock stars we idolized and respected were much older than us? If things follow suit over time, there will be a band of babies, or even fetuses! You don’t have to be filled with rage to enjoy this, but even if you are, the show will surely put a smile on your face. After hearing ‘Gimme Chocolate’, I kind of wished that all their songs were about food, like Cibo Matto’s early work, or Shonen Knife’s Happy Hour album. There’s even a love song and an anti-bullying song, and FIREBOMBS! Despite the extreme volume of the aural assault, the sound was amazing; crisp, clear and powerful. This was the first time that I had ever brought earplugs to a concert, but they were not needed! The venue is the WORST for visibility of a show. Please RAISE THE STAGE of your Ballroom so that everyone can see the show. BUT there are refreshing Melodic J-Pop breaks. BUT they are more like Kyary Pamyu Pamyu backed by Metallica. Flumpool (F is for 4 guys – then they wanted English words that symobolized ‘togetherness’, so they chose Lump and Pool = Flumpool)!!! Good Morning America (They started out as melodic hard-core band singing in English. That didn’t work out. Then they started singing in Japanese as became successful). Golden Bomber is an ‘air band’ – they don’t play their own instruments!!! They’ve been together for 10 years (12 singles, 11 albums). And NONE of them has ever thought of picking up an instrument and learning to play it in all that time???!!! They look cool though! DJ Misoshiru & MC Gohan is one girl who raps about food & cooking. She wears a big gold chain with a cupcake on it, and a chef’s hat. She looks about age 15. Fudanjuko – this Cosplay idol group is an all-girl boy band, with manic female fans! And of course Mr. Children who have been around for ages! ← HELLO. THIS IS YOKO.